A professional photographer can make an average property look great. An amateur photographer can make a great property look average. Shouldn’t your property look great? Professional photographers know how to capture the best angles and get the best room and window views, including amenities. Compare these photos. Slide the control icon back and forth to see how the professional photograph is balanced to show both inside and out. And the sky has been enhanced to blue. TruPlace proprietary HDR photography processing produces the sharpest, brightest, and most detailed photographs possible for Bridgestreet properties – and only TruPlace has it. 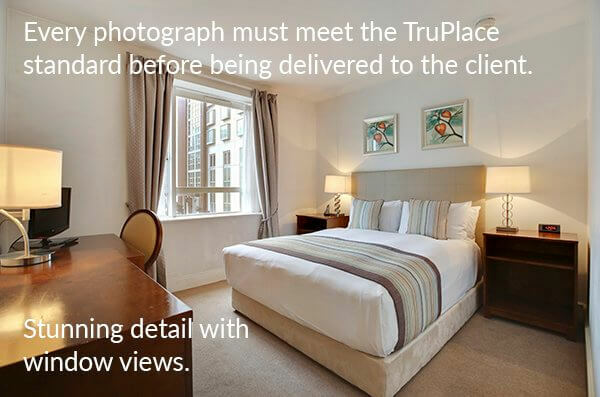 TruPlace photographs are stunning, capturing every interior and exterior detail – even the views out the windows. With 14 years of experience and more than 10 million photographs, TruPlace knows what it takes to deliver high quality professional photography. Our national network of skilled, highly trained photographers, and our world-class quality control deliver eye-popping visuals. ORDER your photography now by filling out the form below. TruPlace will take care of scheduling directly with your on-site contact. You can also call us at 301-972-3201 or send an email to CustomerService@TruPlace.com. What features will the photographer capture? The photographer will photograph the unit in its entirety as well as building exteriors and on-site amenities. Does the photographer stage the property? We know your cleaning staff is hard at work making everything perfect before photography. The photographer is happy to also hide standard items such as collateral, soap, paper towels, etc. at your request. Should we reschedule if there is inclement weather? Our photos are always processed with blue sky enhancement, so no need to worry about cloudy or rainy days. What if a unit has a last minute booking? It is best to contact TruPlace right away if occupancy of the unit(s) we are photographing changes and we will reschedule. We ask that this is done by 12:00 noon on the business day prior to your appointment. Read Terms of Service HERE.